Citrus Green, AmeriTote HD Plastic Shopping Bags, 12" x 10" + 4"
Purple, AmeriTote HD Plastic Shopping Bags, 16" x 15" + 6"
Purple, AmeriTote HD Plastic Shopping Bags, 12" x 10" + 4"
Citrus Green, AmeriTote HD Plastic Shopping Bags, 16" x 15" + 6"
Clear, AmeriTote HD Plastic Shopping Bags, 12" x 10" + 4"
Pink, AmeriTote HD Plastic Shopping Bags, 12" x 10" + 4"
Purple, AmeriTote HD Plastic Shopping Bags, 22" x 18" + 8"
Pink, AmeriTote HD Plastic Shopping Bags, 16" x 15" + 6"
Clear, AmeriTote HD Plastic Shopping Bags, 16" x 15" + 6"
Clear, AmeriTote HD Plastic Shopping Bags, 22" x 18" + 8"
Red, AmeriTote HD Plastic Shopping Bags, 16" x 15" + 6"
Citrus Green, AmeriTote HD Plastic Shopping Bags, 22" x 18" + 8"
Red, AmeriTote HD Plastic Shopping Bags, 12" x 10" + 4"
Red, AmeriTote HD Plastic Shopping Bags, 22" x 18" + 8"
Pink, AmeriTote HD Plastic Shopping Bags, 22" x 18" + 8"
Ameritote shopping bags are the ultimate retail carry bag. A stylish concept in upscale packaging featuring a unique gusseted bottom which allows each bag to stand up on its own without cardboard inserts. This high density bag with soft loop handles is ideal for gift shops, craft stores, farmers markets and more. These bags are made with 25% to 80% recycled material and are made in the U.S.A. Each Ameritote bag is also reusable, making it an economical and environmentally smart add-on to any business. 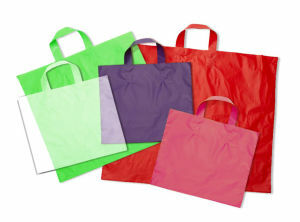 At American Retail Supply, we offer Ameritote shopping bags in 3 sizes and 5 different colors! Every Ameritote bag is also 100% customizable upon request and is 2.25 mil in thickness.